As we approach the general sessions of another General Conference of the LDS Church next weekend, I reflect on my favourite quote from the last conference in April. 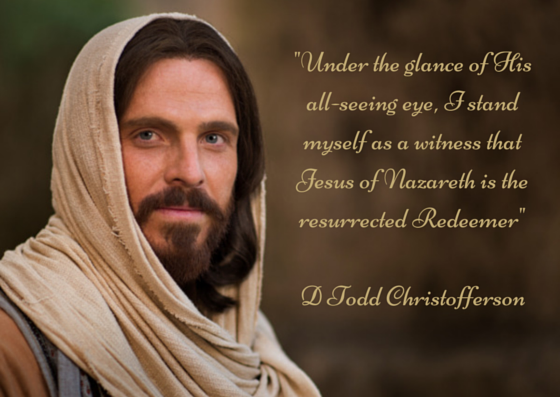 This one from Elder D Todd Christofferson. His whole talk was a beautiful testimony of Christ, and I select below, just a portion. “The Savior is not dependent on food or water or oxygen or any other substance or power or person for life. Both as Jehovah and Messiah, He is the great I Am, the self-existing God. He simply is and ever will be. By His Atonement and Resurrection, Jesus Christ has overcome all aspects of the Fall. Physical death will be temporary, and even spiritual death has an end, in that all come back into the presence of God, at least temporarily, to be judged. We can have ultimate trust and confidence in His power to overcome all else and grant us everlasting life…. [T]he Savior makes all things right. No injustice in mortality is permanent, even death, for He restores life again. No injury, disability, betrayal, or abuse goes uncompensated in the end because of His ultimate justice and mercy…. Categories: Quotes | Tags: Atonement, Christ, Christian, Faith, General Conference, LDS, Mormon, Religion, Resurrection | Permalink.